WASHINGTON — The meeting of President George Bush’s cabinet on Jan. 8, 1991, was even more high-stakes than usual. Iraq had invaded Kuwait. Half a million American troops were deployed and ready to attack. But many lawmakers were demanding a vote before any war. Rejecting mainstream constitutional views, William P. Barr, the deputy attorney general, told Mr. Bush that he wielded unfettered power to start a major land war on his own — not only without congressional permission, but even if Congress voted against it. “Mr. 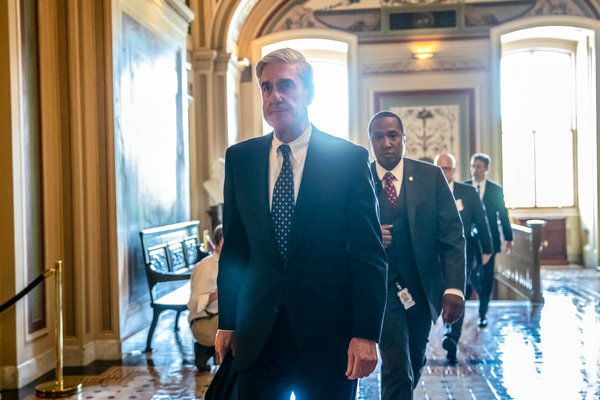 President, there’s no doubt that you have the authority to launch an attack,” Mr. Barr said, as he later recalled. Ultimately, Mr. Bush was cautious about invoking that maximalist theory of executive power and asked lawmakers for support anyway — a prudent step that Mr. Barr, whom Mr. Bush soon elevated to attorney general, also recommended. Congress’s vote ensured the Persian Gulf war was lawful. Nearly three decades later, President Trump has nominated Mr. Barr to return as attorney general. But unlike the self-restrained Mr. Bush, Mr. Trump revels in pushing limits — a temperament that, when combined with Mr. Barr’s unusually permissive understanding of presidential power, could play out very differently for the rule of law than it did last time. Senator Lindsey Graham, Republican of South Carolina and the new Judiciary Committee chairman, told reporters after meeting with Mr. Barr last week that the nominee had said he saw no reason to fire Mr. Mueller and had pledged to “err on the side of transparency” about any report. But neither statement addressed what he would do if Mr. Trump ordered him to act otherwise. Mr. Barr is likely to be confirmed because Republicans control the Senate and because defeating him would leave in place the acting attorney general, Matthew G. Whitaker, a Trump loyalist whose installation in that role Democrats see as illegitimate and a threat to Mr. Mueller. Ethics officials advised Mr. Whitaker to recuse himself from the Russia case, but he refused. Mr. Barr started his career as a C.I.A. analyst before becoming an agency legislative affairs official in the mid-1970s, during the post-Watergate and post-Vietnam War era when a congressional investigation dragged decades of intelligence abuses into the light over the executive branch’s objections. After going to law school, he joined the Reagan White House and worked on domestic policy with C. Boyden Gray, the counsel to then-Vice President George Bush. At the time, the administration was battling Democrats in Congress over its push for deregulation. The conflicts helped spur the Reagan legal team to develop new executive power theories that would diminish the influence of Congress. Their legal policy innovations intensified in Mr. Reagan’s second term, after Mr. Barr had returned to private practice and senior administration officials were caught steering aid to anti-Marxist militants in Nicaragua despite a law forbidding such assistance. The scandal, known as Iran-contra, set off investigations by Congress and an independent counsel. Amid the fallout, the Reagan legal team called into question the legitimacy of both the law barring aid and one allowing for prosecutors the president could not fire. The president’s lawyers saw them as congressional encroachments on the president’s rightful powers, though the Supreme Court upheld the independent counsel law in 1988. The next year, when Mr. Barr returned to public service in the new Bush administration, he took up the executive power mission as the head of the Office of Legal Counsel, the powerful agency within the Justice Department that evaluates the legality of proposed executive branch actions. Mr. Gray, who had become White House counsel under Mr. Bush, “was intent on getting someone in that position who believed in executive authority,” Mr. Barr later recalled. Normally, the Office of Legal Counsel waits to be asked a specific legal question about a particular dispute before weighing in. But among his first major acts was to write an apparently unsolicited 10-page memo to top lawyers across the executive branch, urging vigilance against any attempts by Congress to limit presidential power. “Only by consistently and forcefully resisting such congressional incursions can executive branch prerogatives be preserved,” he wrote. Mr. Barr denounced lawmakers’ pursuit of sensitive administration information for oversight investigations and the creation of legal limits on the president’s power to fire certain officials in order to give them a degree of independence. “The power to remove is the power to control,” he wrote. 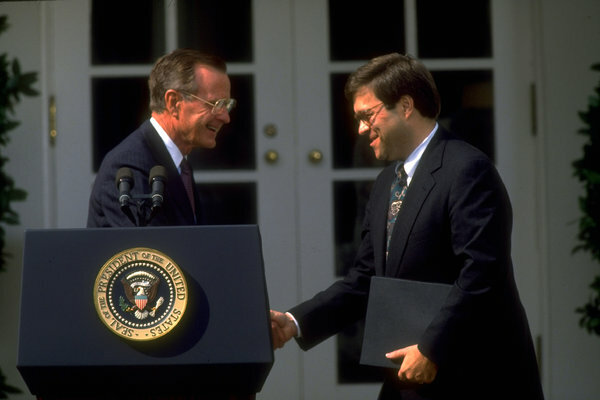 As Mr. Bush’s term progressed, Mr. Barr not only argued that the president could unilaterally launch the gulf war without Congress — echoing a move by President Harry S. Truman, to enduring legal controversy, in the Korean War four decades earlier — but also sought to push the boundaries of presidential flexibility in many other ways, large and small. In 1990, for example, Mr. Barr asserted that the Bush administration could lawfully choose to disregard a law in which Congress, as a condition of funding a diplomatic delegation, required that a representative from a congressional panel be included. Arguing that Congress had no authority in the area of foreign affairs, he asserted that it was therefore “self-evidently” true that lawmakers could not enact a law influencing the president’s choices of diplomatic agents. That same year, he argued more broadly in a panel discussion that even with the power of the purse, lawmakers lack the authority to influence policy by placing conditions on appropriations for government activities that fall under the president’s executive powers. Ultimately, Congress only has the power to provide a “lump sum” to the president in those cases, he said. A portion of a memo written by Mr. Barr. In the years after the Bush administration ended, Mr. Barr became a top lawyer for the telecommunications company that evolved into Verizon, working mainly on business and regulatory issues. But he also continued to play a role in legal policy debates over executive power and national security, especially after the Sept. 11 attacks. After Congress enacted the USA Patriot Act to loosen restrictions on government surveillance that grew out of the 1970s oversight investigations, he testified that the new statute had been a good first step but did not go far enough. In 2005, after the George W. Bush administration’s detainee abuses started coming to light, he defended Mr. Bush’s power to declare that prisoners in the war on terror were not protected by the Geneva Conventions and so could be lawfully subjected to coercive questioning.